This marks the first BTN I've done on a deceased actor. I tried not to let that sway(ze) me one way or the other. I'm not apologizing for that joke either. I have always liked Swayze. I didn't think he was the most dynamic actor, but he managed to bring something to every film he was in. A quick rundown of how this all works for those who are new to the process. Look at that. When the numbers are crunched, it comes out to 62% positive over 38% negative. He officially was a good actor. And those numbers are locked in forever. Was there bias on my part to make sure it skewed that way? Those are some nasty thoughts you're having. I think you know me better than that. I certainly wouldn't break my own rules and throw a couple points in for a miniseries or two, now would I? Nah... *whistles innocently* What? Marlene warned me his ghost might haunt me if I wasn't nice. Thanks to ASBLACKASOBAMA and Marlene for this week's choice. The list has grown to a respectable size, but I'm still taking suggestions this week. Simply tell me in the comments below who you'd like to see covered. If I haven't already done the numbers or put them on the list, I will add them. Nice, if only each of our posts and reviews could earn such awesome ratios lol.. Damn you Patrick Swayze.. Seriously, they had to exhume the freaking "Munchkins" so he'd have somebody his own size to beat up on in "Roadhouse." In this case I think the okay movies need to be added to the bad. Leaving us with 32% good and 68% bad. He was pretty good in Donnie Darko (wasn't in it that much) and Point Break. But "good" is a relative term. I was holding my breath on that one! Glad it turned out to be 'good'. Awww, poor Swayze :( So sad how he passed... as a kid I loved him in Dirty Dancing, The Outsiders and Ghost. Hey, um, I'm waiting for a By The Numbers: Corey Feldman ... hee hee. I trust your biases, TS. I don't trust movie Producers. Swayze was way too talented to not get better roles. Pretty solid BTN! I wouldn't argue with the results. 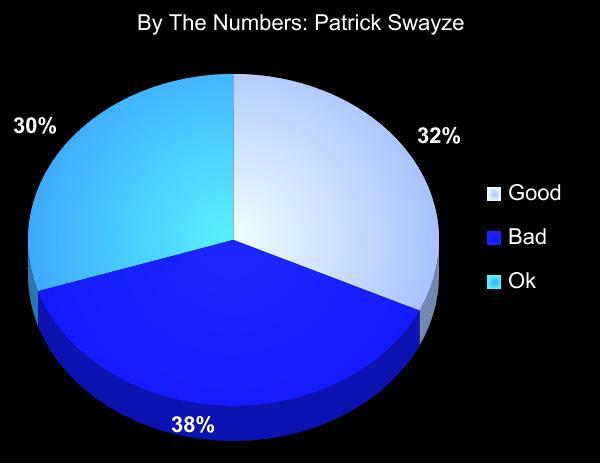 Yeah Swayze, is it a coincidence that he was used in my movie game this week? I want to see Wilfred Brimley (and you have to use the diabetes commercials too) and Clint Howard. Wait, how did you score Road House? Was it bad, or good, or so bad that it's good?